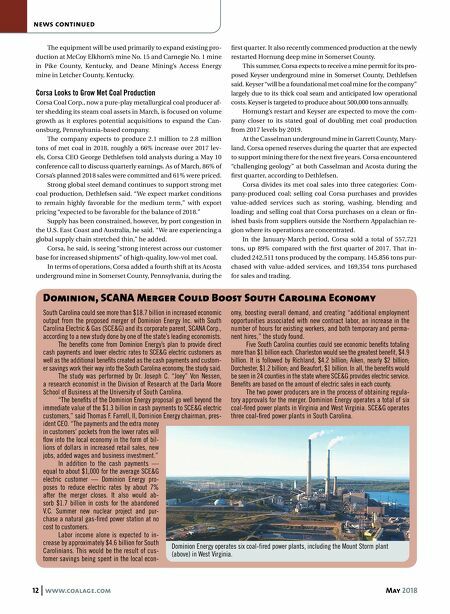 May 2018 www.coalage.com 13 news continued Dethlefsen said his company's growth strategy centers around acquisitions. He said Corsa is in discussions on a couple of potential asset purchases, although he did not identify them. But anything Corsa buys "must provide synergies to our sales and trading strategies," he stressed. "We prefer producing properties to development opportunities. We're looking at a multitude of op- portunities, some regionally, some not regionally, to enhance our scale," although it must be done on an accretive basis. Corsa recorded total revenue from continuing operations of $80.4 million in the first quarter, an improvement of 54% over a year ago. The company posted net income from continuing operations of $2 million, or 1 cent/share, versus net income of $11.9 million, or 8 cents/share, a year earlier. Hallador Boosts Full-year Coal Sales Forecast Hallador Energy Co. has boosted its steam coal sales forecast for 2018 after a fine first quarter and is banking on its newly complet- ed Princeton Loop in Gibson County, Indiana, to secure addition- al business in the coming months, according to its president and CEO, Brent Bilsland. Bilsland told analysts during a May 8 conference call to dis- cuss quarterly earnings that Hallador, the parent company of Illinois Basin coal operator Sunrise Coal, produced 1.98 million tons in the January-March period, a 3% increase over a year ago. Q1 coal sales totaled 1.71 million tons at an average sale price of $39.13/ton, up 9.8% from the first quarter of 2017 when the aver- age sale price was $40.23/ton. Pleased with its latest results, Hallador raised its sales forecast for this year to 6.8 million to 7 million tons. Almost all of those tons - 99% - are committed at an average estimated price of $40/ton. If the company sells more than 7 million tons this year, it will give "serious consideration" to reopening its Carlisle under- ground steam coal mine in Sullivan County, Indiana, Bilsland said. Carlisle, a continuous miner operation and once Sunrise's flagship mine, has been idle since the first quarter of 2016. The company is spending about $5 million annually to hold Carlisle in "hot idle" status, Bilsland said, adding, "so we're look- ing for opportunities to turn a $5 million annual drag on earnings into a positive free cash flow generating asset." The mine has a capacity of about 2.5 million tons annually. With Carlisle out of the picture for the past couple of years, Hallador has relied almost exclusively on its two Oaktown under- ground steam coal mines in Knox County, Indiana. Sunrise ac- quired the continuous miner operations from Vectren Fuels Corp. several years ago. Bilsland said Hallador is optimistic about the future for sev- eral reasons, including that it has nearly 21 million tons of steam coal fully contracted over the next five years. That sales position represents about 60% of the company's anticipated total sales over the next half decade. Part of Bilsland's optimism also stems from the now-available Princeton Loop, a truck-to-rail loading facility that Hallador is counting on to extend its sales reach to power plants served by the Norfolk Southern (NS) and CSX railroads. Bilsland said the Loop, which has "fundamentally changed our marketing ability," does a couple of different things for his company. "One, is it gives existing customers that had plants on both the CSX and NS flexibility, so that if they buy coal from us through a CSX-served plant and they have a problem there, they know that they can come back to us and figure out a way to move that coal to their NS plant while they solve their problem at their CSX plant. So, it gives a lot of flexibility to our customers and makes them feel comfortable that they can then buy bigger volumes from us because they have the optionality in where they can go with it." Until now, he said, "there were customers that we could nev- er bid to before because we just didn't have a way of getting the coal there." Recently, Bilsland added, the new Loop helped Hallador/ Sunrise pick up two new customers, although they were not iden- tified. One of the new customers, he disclosed, "is being fully ser- viced via the Princeton Loop as well as an existing customer is being serviced via the Princeton Loop." Bilsland said his company also is heartened by the fact that none of its current customers has announced plans to close coal-burning generating units in the next five years. Lawrence Martin, Hallador's CFO, said the company posted net income of $2.1 million in the first quarter of 2018, compared to net income of $7.4 million in the year-ago quarter. Hallador's total adjusted EBITDA was $18.9 million for the latest quarter, and the company reduced its debt by $11.3 million. Coal Shipments Increase Through Port of Toledo in Q1 2018 Coal shipments through the Port of Toledo, Ohio, rebounded in the first four months of 2018, surpassing year-ago levels by 28.55%, according to figures released by the port in mid-May. In all, 330,260 tons of steam and metallurgical coal moved through the port during the four-month period, with met coal shipments to steel mills in Canada and the northern U.S. remaining strong. "In general, the coal we handle now is more metallurgical and that is kind of a function of how steel production is in Canada and the United States," said Joe Cappel, the port's vice president of business development. The port is located on Lake Erie in north- west Ohio. "I think it's going to be a good year." During the January-April period, 259,759 tons of coal were shipped through the port to Canada, up 36.28% from the 190,612 tons a year earlier. Meanwhile, 70,501 tons of coal were shipped through the port domestically during the period, an increase of 6.35% from the 66,293 tons a year ago. Cappel said the 2018 shipping season got off to a promising start, although "not quite as strong as last year. But compared to 2015 and 2016, we're doing more." Although Cappel and the port do not make specific shipping projections for the entire year, he said, "steel production should remain strong and coal should be on par with last year" in 2018. "Met coal is fairly split between the U.S. and Canada, although Canada is pretty much all met coal." Steam coal volumes are being suppressed somewhat by new natural gas-fired plants in Ohio and Pennsylvania, along with Canada's general shift away from steam coal. Spring and fall typically are the busiest seasons at the port, primarily because of the grain harvest. Coal shipments, especial- ly met coal, are more evenly spread throughout the year.